Clear the board and avoid the boneyard with Pogo's free online Dominoes! Match Domino pieces with the same number of dots. To score points, make the gold end pieces add up to any multiple of 5 (5, 10, 15, 20, etc.). If you play all of your dominoes before your opponent, you receive points for all of the "bones" (dominoes) left in your opponent's hand. You receive one point per dot. In the online version of this classic board game, you'll receive tokens (equal to the number of points you earn) at the end of the game whether you win or lose, as long as you finish the game. Determine the length of your online board game: Short Dominoes games run until one player reaches 100 points. But, if you're up for a longer game, you can set this option to 250 points. 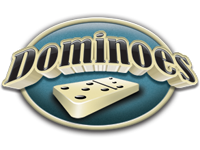 Demolish the competition with the most dynamic dominoes game online! At the beginning of a new Dominoes game, seven "bones", or pieces, are dealt to each player, and the player with the highest double plays that bone first. So, for example, if someone has the double six, then they go first. If no one has the double six, then the person with the next highest double plays first. If neither player has a double, the player with the highest value domino must play it first. After the first hand, the person who plays first can play any domino they have in their hand. In the online version of this classic board game, to play a bone, match the ends of a bone in play with the end of one in your hand. If you cannot match, you must draw from the bone pile until you can play. Score by matching and making the board total equal a multiple of five (5, 10, 15, 20, etc.). Play a bone by dragging it onto the table. Bones in your hand that cannot be played are darkened. When you drag a bone to play, a ghost image will indicate the closest legal play, while the gold arrows point to other areas where that domino can be legally played. Drop the bone in place by releasing the mouse in the location you wish to play (you'll see the ghost inside the outline). If you cannot play from your hand, you will draw from the bone pile (the undealt dominoes) that slides in from the left side of the screen. You may click in the bone pile to select dominoes one at a time, or click on the "Quick Draw" button to automatically draw until you find a playable domino (or until the bone pile is exhausted). If your hand becomes filled or the bone pile has been exhausted and you still cannot play, your turn is skipped. If both you and your opponent are skipped and there are no more dominoes remaining in the bone pile, the game ends and the player with the lowest total score wins the hand). If both players end the hand with the same score, that hand ends in a tie. Here are some tips and tricks to make you a dominoes champion! Keep the board count low until you are ready to score. If you win the game, you will get a Jackpot Spin. The game ends as soon as you (or your opponent) score the required number of points to win, even if you just started a new hand and have several dominoes remaining. In the online version of this classic board game, scores will be lower until the top and bottom of the spinner is played. Keep count of the bones and values in play and in your hand. Note which matches your opponent does NOT make, and when he draws. Try to prevent your opponent from scoring, based on the visible tiles in play and in your hand. Block your opponent from playing, thus forcing draws from the bone pile, by playing tiles you think he or she cannot match. The 0-0, 0-5, and 5-5 bones are useful for scoring immediately after your opponent does, hang on to these until you can play them.